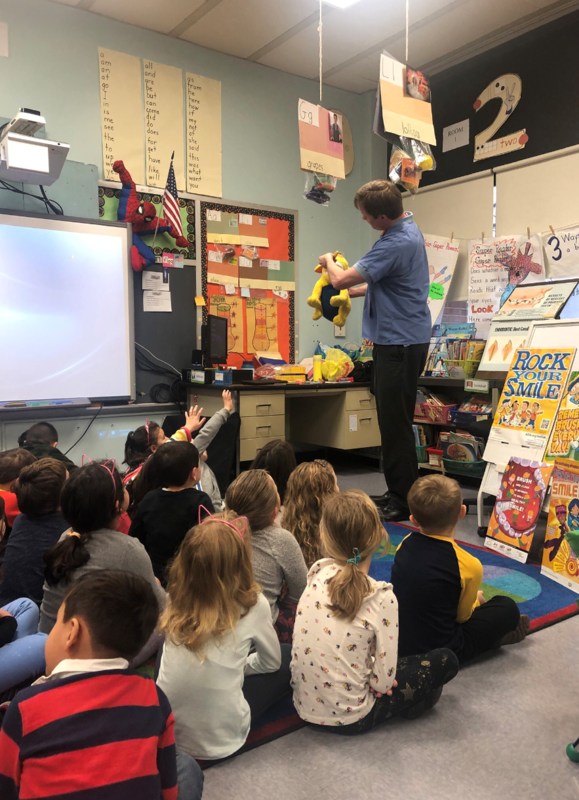 On February 8th 2019, Dr. Kurt M. Krause, DMD was invited to Cranford, NJ’s Walnut Avenue School to promote oral health awareness for kindergarteners during National Children’s Dental Health Month. During his visit, Dr. Krause encouraged beneficial dietary habits to help children maintain good oral health. He spoke about keeping teeth safe during sports and encouraged proper dental hygiene on a regular basis. He also showed students a film about visiting the dentist. Dr. Krause practices general dentistry in his native Cranford, attended Cranford Public Schools and earned his dental degree from the University of Medicine and Dentistry of New Jersey. Healthy Hydration is set as the goal of the of the 2017 American Dental Association’s (ADA) Children’s Dental Health Month in February with the theme “Choose Water for a Sparkling Smile”, according to Dr. Kurt M. Krause, dentist of Cranford. As with food choices, your chosen method of hydration can be healthy or unhealthy for you. Children and young adults often need guidance in this area. It is estimated about half of teens consume sport and energy drinks and about two thirds report having at least one soft drink a day, as reported by the Academy of General Dentistry. This may occur because it’s socially acceptable, easily available and intensely advertised. Also, trends of more frequent consumption could also be traced to the sweet formulation. Connect this with the increased volumes sold and potentially addictive-like behavior and harmful health consequences can follow. Declines in soda sales have partially prompted beverage companies to develop energy drinks. Just like soda sales declined due to consumers’ education, we should hope that energy drink sales will drop off due to greater awareness of their harmful effects. The oral and systemic consequences for the inappropriate use of soda, sports drinks and energy drinks, referred to as “sugary drinks,” are similar. These beverages can increase the risk of obesity and may play a part in diabetes development in susceptible persons. They can increase the risk of tooth decay and gum disease and are one of the most significant dietary sources of tooth decay. Oral bacteria ingest the sugar and release acids which attack tooth structure and weaken it. Each sip results in a 20 minute tooth acid attack. The Academy of General Dentistry found that energy drinks cause twice the damage as sports drinks and contain caffeine. Even sugar-free drinks such Diet Coke can cause damage. According to the ADA, it is recommended to limit soda to occasional use, avoid energy drinks and sport drinks unless you’re involved in extremely vigorous protracted activity. Remember that drinking 8 glasses of water daily is ideal. Benefits of water are that it: with added fluoride strengthens teeth; cleanses the mouth (washes away residue of food from meals); fights dry mouth (cause of cavities); helps prevent weight gain. Endurance athletes can experience dry mouth, increasing their potential risk from sugary drink consumption. Pre-activity hydration for athletes can help avoid the intense thirst leading to abuse of sports drinks. If consumed in moderation, use a straw to avoid contact with the teeth and drink or swish with water after. Delay brushing teeth for about one hour, allowing the saliva to neutralize the acid to avoid causing toothbrush erosion. Make sure to read labels for sugar content and consider diluting the beverage with water. A healthy alternative to sugary drinks is sugar-free electrolyte powders mixed with water or diluted beverage. Products with 10 percent all natural juice with water are also preferable. Share this information with young children and teens. Encourage them to make informed healthy hydration choices. The right liquids at the right time will go far toward an overall balanced nutritional intake. The ADA recommends “brush teeth two minutes, two times a day, eat healthy, limit sweet snacks and drinks and visit your dentist regularly.” The ADA is America’s leading advocate for oral health.